On Sunday February 3, the Patriots and Rams and facing off in Super Bowl 53! The game time action is great, but so are the foods that accompany it! Wings, pizza, ribs, subs… which is your MVP?? These Connecticut restaurants and bars have eat-in and take-out specials to keep you satisfied as you cheer on your team. The Blind Rhino, Norwalk: For the 4th year in a row, The Blind Rhino hosts "the biggest super bowl pregame party in CT." This year, The Spread & El Segundo are joining the party and doing a mini pop up inside the Rhino. There will also be live music and entertainment provided by Best Trivia Ever. Bobby V’s, Stamford: Catch the big game at Bobby V's in Stamford. A $45 ticket includes seating with a view of the game from every seat, a buffet, giveaways, and beer specials. VIP Packages available. Bear’s Smokehouse @ The Stack, New Haven: The Stack, featuring Bear’s Smokehouse BBQ in New Haven, will be offering three “Big Game Packages." Orders must be placed ahead of pick-up and can be placed online (www.bearsbbq.com), in-person, or by calling (203) 780-8157. This package is also available at Bear’s Windsor, South Windsor and Hartford locations. Lock City Brewing, Stamford: Lock City Brewing's annual Super Bowl Party is back! They have a new projector for premium viewing. They'll also serve finger foods and a round of complimentary beer. Tickets are $35. SolToro, Mohegan Sun: Snack on street tacos and sip on margaritas while watching the Super Bowl at SolToro on February 3. Lighthouse Pizza, Stratford: Curly Fry Pizza? Parmesan Garlic, Buffalo, and BBQ Wings? Buffalo Chicken Stuffed Bread? Yes, please! It's all on Lighthouse Pizza's Super Bowl catering menu. O’Neill’s, Norwalk: At O'Neill's in Norwalk the pregame party starts at 2pm with live music by 27 West. Then, watch the game starting at 5:30pm. There will be $1 wings all day for eat in or take out. Match Taco, Bridgeport: Match Taco has the perfect catering menu for Super Bowl. Pick up your Taco Kits complete with…All You Need for a Taco Party, Taco/Burrito Set Ups, Nachos, Chips - Guacamole & Salsa, Pork Belly Taquitos or Enchiladas. Geronimo Tequila Bar & Southwest Grill, Fairfield: Geronimo in Fairfield will be offering a Super Bowl To-Go package available for pick-up Saturday or Sunday (up until 4pm). For $60, get an order of chips, guacamole, salsa, ribs, mac & cheese, and wings. Wings Over Fairfield, Fairfield: Order online or get wings delivered from Wings Over Fairfield, located on Black Rock Turnpike. Bull & Swine, New Haven: Bull & Swine's Super Bowl Party is bittersweet- it's the restaurant's final night in business but also a great time! For $35, enjoy a BBQ buffet and open bar. Dinosaur BBQ, Stamford: Dinosaur Bar-B-Que's offers a number of packages via their Gameday Catering. Choose from wings, ribs, BBQ, and sides for 10 or 20. Molly Darcy’s, Danbury: Watch the Super Bowl at Molly Darcy's on 10 foot screens with surround sound. There will also be giveaways and a half-time menu. Rosie, New Canaan: Place your Super Bowl order at Rosie in New Canaan for dishes like Place your order now to ensure that your Superbowl Sunday will be filled with delicious classics from Rosie like Turkey Chili, Guacamole and Homemade Tortilla Chips, Grilled Adobo Shrimp, Chicken or Beef Brisket Enchiladas and Crispy Fried Chicken Wings. Don't forget dessert! Jo Jo’s Deli, New Milford: Jo Jo's Deli in New Milford has a special Super Bowl catering menu. Order grinders, pasta, wings, and more. Blackstone Irish Pub, Southington: Blackstone Irish Pub's Super Bowl party includes an open bar during the game, free half time buffet, door prizes, giveaways, and raffles. Tickets are $35. 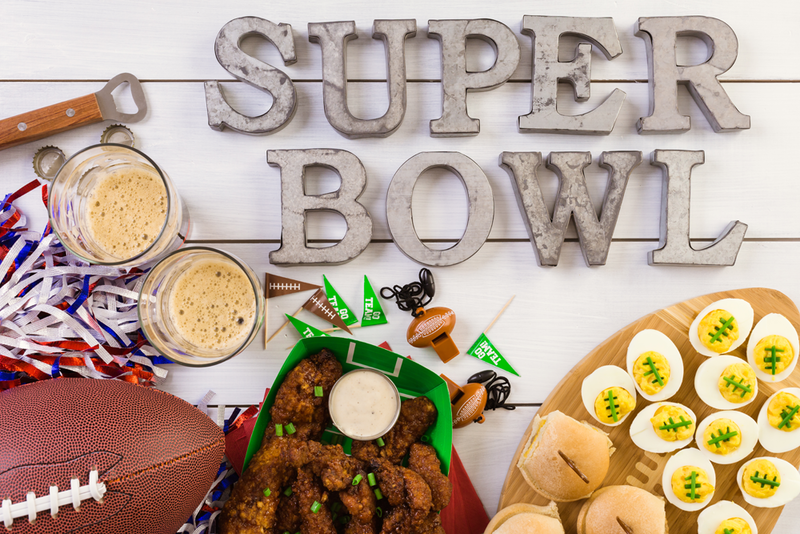 Coalhouse Pizza, Stamford: Coalhouse Pizza in Stamford is now taking Super Bowl catering orders. They're named for their pizza- but their wings and other game time snacks are tasty too! El Segundo & The Spread, Norwalk: El Segundo is teaming up with The Blind Rhino and doing a mini pop-up in honor of the Super Bowl. J Timothy’s Taverne, Plainville: J. Timothy's Taverne in Plainville is famous for their wings... so famous that you need to pre-order them for the game! Vinny’s Backyard, Stamford: Vinny's Backyard in Stamford serves up a menu of football specials like sliders, pickle chips, nachos, and jumbo pretzels. Buffalo Wild Wings, Connecticut: Buffalo Wild Wings has CT locations in Southington, Waterbury, Milford, North Haven, Wethersfield, Manchester, Stamford, Windsor, Danbury, and New Haven. Taco Loco, Bridgeport:For just $54.95, Taco Loco's Super Bowl package includes a Family Pack of Tacos, 16 Wings, Nachos Superior, 10 Mini Burritos, 4 Quesadillas, Salsas, Dips, and Chips. Stew Leonard’s, Norwalk, Danbury, Newington: Stew Leonard's has an assortment of Super Bowl Game Day Favorites. Pick up subs, pigs in a blanket, ribs, wings, pizzas, and more. Judy’s Bar & Kitchen, Stamford: Judy's Bar + Kitchen is celebrating the Super Bowl with happy hour price drinks all day Sunday! They also have a catering menu available that even includes a Family Meal Deal for 4 people. Bistro On Main, Manchester: They will be serving a special Super Bowl catering menu for the big day. Fresca Tequila Bar & Grill is having a Super Bowl party with margarita, beer and wing specials all day long! Three J's Cafe, Bolton is serving a Free buffet during the game! Match Burger Lobster, Westport: They will have a catering menu available including boxes of Mini Match Burgers, Lobster Rolls, Carpetbagger Buns, Veggie Burgers & Ahi Burgers. Mulberry Street, Manchester: You’re going to want to order early for their wings and pizza to go! Dining room stops seating at 5pm for the big game. Harlan Social, Stamford: Visit Harlan Social in Stamford for their annual Super Bowl all-you-can-eat Chef's buffet with unlimited craft brews and house wines. It is $65. Reservations strongly recommended! Harlan Publick, Norwalk: Harlan Publick's private tap room comes fully equipped with TVs so you can watch the big game. Book it for your group of sports fans today.